The folks at Apple have been on a roll lately. On Tuesday, they unveiled new and improved versions of the iPad Air and iPad Mini, and just a day later, they introduced a host of upgrades to their iMac line as well. And if you thought that they were going to stop there, well…you thought wrong, because Apple (finally) revealed the 2nd generation of AirPods last night. Aesthetically, the design remains unchanged, but several improvements have been made under the hood. The star of the show here is undoubtedly the new H1 chip, a brand new processor that Apple have designed specifically for their headphones. In addition to offering 50% more talk time than first-generation AirPods, they also boast two times faster connect times, which is impressive when you consider how efficient the current iteration already is. On top of that, Siri functionality has been improved as well. While Apple’s virtual assistant has always been available through a double-tap command, you can now activate it hands-free by simply saying “Hey Siri”, just like you would do on an iPhone. The AirPods themselves aren’t the only things that have received an upgrade. The charging case now comes in a Qi enabled option, which means that you can now charge it via wireless charging. This feature has been on the wishlist for many an Apple fan, and we’re glad to see it finally become a reality. 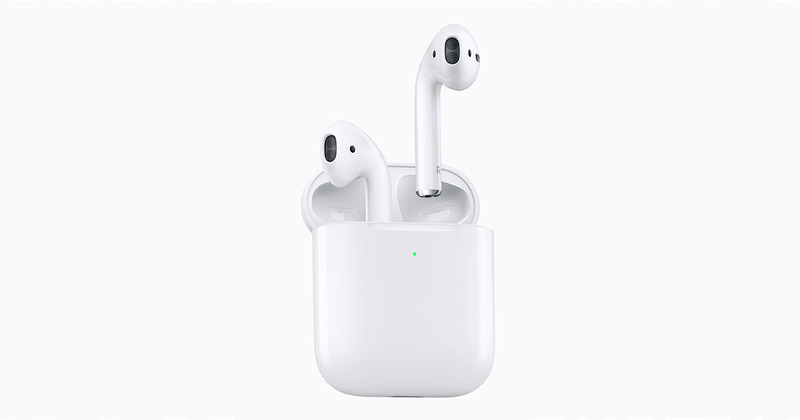 Price-wise, a pair of AirPods with the standard charging case will remain at its original price of S$239/RM699, while the AirPods/wireless charging case combination will cost S$299/RM879. If you already own a pair of AirPods and just want the wireless charging case, that’ll set you back S$119/RM439. Don’t go running to the Apple Store just yet, though. The new options will only be released “later this Spring”, which, considering that we’re living in an eternal summer, could be anywhere from a few weeks to a few months. The bright side is that Apple is planning to offer free engraving services if you purchase them on their website, so waiting a little longer might be worth it after all. If you’ve been meaning to own a pair of AirPods, now seems like a good time to jump on the wireless headphone bandwagon.